Erik Stinson: How did this magazine come into being? David Fishkind: Kenneth [Pettersen] contacted me about putting something for him together. I stayed at his apartment in Oslo for a few nights in 2011. He’s a big Drake fan and runs an independent press out there called AFV Press, AFV stands for America’s Funniest Home Videos, and they had previously commissioned me for work (Wikipedia-Style Plot Summary of Armageddon (1998 film) by David Fishkind and Black Metal). He said he wanted me to compile and edit a chapbook or short something, the only terms being I couldn’t have my own writing in it and no poetry. It was originally supposed to be like 30 pages max, but I ignored that, assuming he’d just print whatever I gave him, and he did. Also there are three poems in it, though I did say no poetry to the writers and artists I solicited. ES: Who paid for it? DF: Kenneth and Kristine [Kleppo] and Jens [Johan Tandberg], I guess. Jens designed it, so maybe he didn’t pay for it. Kristine is the co-editor, so maybe she paid less than Kenneth. Kenneth said he paid 5500 NOK to print 100 copies. ES: What is the simplest way to describe it? DF: The way we’ve been describing it is as an anthology. It is all new work by the contributors, none of it previously published, so it differs from an anthology in that way. Anyway, it includes short prose, messages, collage, photographs, an interview, a play and three poems. DF: Jens Johan Tandberg. I ordered things, but then he made it look good. I think he changed the order of one of the photographs to make it look better. Here is a link to his website. ES: What are your plans for the release? DF: It was released in Europe on November 8 but those copies are all sold out. There’s going to be a release party with a bunch more copies available on December 12 at Interstate Projects in Bushwick. That’s from 7:30 to 10:00. Some of the contributors will read for like five minutes. Off the top of my head, I think it’s Atticus, Adam, Ben, Zachary, Lucy and Matt. I’m buying a lot of beer and copies of the publication can be purchased for $10. You’ll also be able to order copies direct from me for $12, that includes free shipping, via paypal. Paypal dfishkind@gmail.com and I’ll start shipping those out on December 13. ES: Do you expect additional issues? DF: It’s too early to think seriously about stuff like that. It was conceived by the publishers as some one-run chapbook or something, but I didn’t really follow the guidelines and it ended up looking a lot more like a journal. So maybe this opens the door for future stuff. I’ve, like, toyed with the idea of doing it again in two years, hopefully with AFV because I like the way we’ve worked heretofore, and then maybe again two years after that. I don’t know, it would be cool to have a biennial publication and keep some of the same contributors on and maybe get others to do other stuff. I can imagine that being a rewarding thing to have in my life. ES: Do you feel you contribution was more curatorial or editorial? DF: I wanted a nice range of medium and approach and stuff. There are a few different divisions in the publication that I think a keen eye will be able to figure out, and that was me, I guess, curating the thing. I don’t really like telling people to change stuff, especially when I solicited them. Like, they didn’t hear about Logue and get all excited to submit, in fact the thing didn’t even have a title, I just called it “Norwegian magazine publication thing” at first in emails; I asked them to contribute. So it seems kind of impertinent to tell people to take stuff out and go in and fix things, but that’s what I did. A lot of people I came at them like an editor. Other people I asked to send in different things and they did, and sometimes we had to work on stuff and sometimes we didn’t. When my name is on something as an editor, and I guess this is the first… time for me having that, I want it to reflect my standards. If things seem inconsistent, then that reflects poorly on me. So I was both. I think it worked out well. 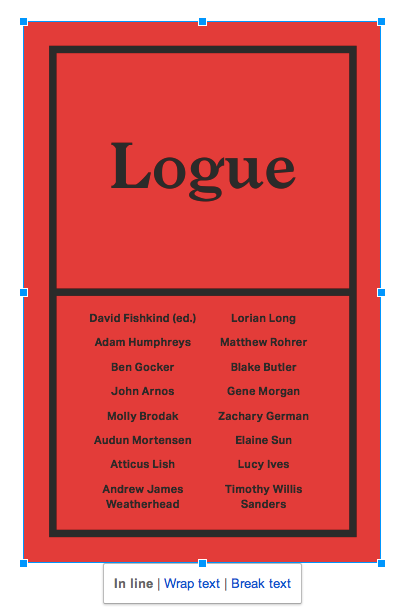 Logue is an anthology of short prose, essay, messages, collage, photography, drawing, drama and poetry by Andrew James Weatherhead, Timothy Willis Sanders, Zachary German, Ben Gocker, Lucy Ives, Adam Humphreys, Gene Morgan, Molly Brodak, John Arnos, Matthew Rohrer, Lorian Long, Blake Butler, Audun Mortensen, Atticus Lish and Elaine Sun. It was compiled and edited by David Fishkind, designed by Jens Johan Tandberg and published by AFV Press.